*Designed to resist lateral and uplift loads from hurricane wind forces. *Provides a custom connection for trusses or rafters. 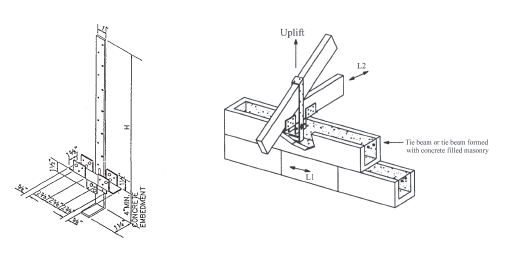 *Attached beam seat eliminates treated sill or moisture barrier installation. *Allows a 4″ minimum embedment in concrete. *Minimum compressive strength of concrete is 2,500 PSI. *14 gauge galvanized steel and 20 gauge seats. 1. All specified features should be used to achieve the values specified on schedule. 3. Nails are necessary in strap and seat to achieve design loads.